Arterial hypertension (or high blood pressure) affects around 20% of the French adult population, and it is also the most frequent cause of cardiovascular problems. The risk of suffering from it increases with age. A person is considered to have high blood pressure when diastolic pressure is over nine and systolic pressure is over 14 – being respectively the lower and upper numbers recorded when measuring blood pressure. High blood pressure is considered as a “silent” or “insidious” disease, as many people do not realize that they have it until symptoms arise. Besides, very few people regularly get their blood pressure checked. Yet, that illness causes major cardiovascular complications and leads to 62% of strokes as per the WHO. The excessive mechanical pressure upon the arteries causes anomalies and fosters rigid artery walls. It therefore increases the risk of atheroma appearing or worsening. The most frequently affected arteries are the carotid (brain), coronary (heart), kidneys and lower limbs. Thus, some risks are heightened, such as the following consequences: strokes, ischemic heart disease (angina and heart attacks), peripheral arterial disease (narrowing of the arteries supplying blood to the legs) and chronic kidney failure. The fragilized arteries may also require dialysis in the long term. Moreover, the high blood pressure indirectly increases the heart’s activity – because it maintains a constant blood flow – and then leads to left ventricular hypertrophy and gradual loss of its contractile activity (possible outcome is heart failure). In that respect, high blood pressure is mainly critical because of its long-term consequences on various organs. Conventional medicine offers a range of “solutions”: diuretics, beta-blockers (to reduce the heart beat) and calcium channel blockers (to diminish vascular resistance) etc. However, these treatments are symptomatic and go along with side effects. Naturally regulating blood flow and blood pressure helps limiting the risks of heart diseases, while effectively protecting the body. WHICH PLANTS ARE MOST EFFECTIVE? The EMA (European Medicines Agency) has acknowledged red vine’s effectiveness in treating circulation problems (venous insufficiency and varicose veins), capillary fragility (small blood vessels that form under the skin), burns and irritations caused by haemorrhoids. The Agency also states that red vine holds some antioxidant, anti-inflammatory and anti-oedema virtues; it protects the liver as well, and procures antimicrobial and diuretic actions. These properties have been tested by scientific researches on grape polyphenols, including resveratrol and oligomeric proanthocyanidin complexes (OPC). Resveratrol (grape skins) is a powerful antioxidant which has shown promising anti-ageing effects on some primitive animal species. Overall, it protects and stimulates the circulatory system. Anthocyanins (red vine leaves) reduce capillary permeability and increase their resistance, thus preventing the venous circulation to stagnate. In grapes, this action is potentialized by the presence of tannins, astringents and vasoconstrictors (the OPC): they facilitate venous return. Refer to the properties of grape seeds for further information. Therefore, consuming red vine extracts helps protecting the venous system by maintaining the elastic fibers, re-establishes circulation, prevents and reabsorbs oedema. Grape seeds are particularly rich in OPC antioxidant, which are 20 times as efficient as Vitamin C and 50 times as efficient as Vitamin E. OPC have a perennial impact on free radicals, the latter being responsible for various disorders within the circulatory system. Indeed, free radicals destroy cellular membrane, damage collagen and lead to the hardening of arteries (increased risk of high blood pressure). As opposed to those disorders, OPC improve blood vessel elasticity, prevent blood platelets from sticking together, hence reducing the risk of blood clots and aphasia. Moreover, those complexes also help diminishing the amount of cholesterol deposed on blood vessel walls. Grape seeds finally boost exceptional anti-inflammatory and anti-oedema properties. Numerous clinical studies have been conducted in France to demonstrate how grape seeds can be used to treat capillary fragility and varicose veins. In a double-blind study, 71 patients with venous insufficiency were divided in two groups. Each group was given a daily dose of 300mg of either grape seed anthocyanidins or a placebo. 75% of the former showed significant reduction in functional symptoms, compared to 41% of the latter. Tests show that administering anthocyanidins enhances venous tone in patients with extensive varicose veins. Another clinical trial featured two groups of geriatric patients suffering from low capillary resistance. Each group was treated with 100-150mg of either anthocyanidins or placebo. 50% of the former showed improved capillary resistance after two weeks. Blueberries are rich in Vitamin C and contain iron, magnesium, potassium and phosphorous. They are also composed of a record-breaking quantity of flavonoids with anti-cancerous, antioxidant and fluidizing properties. Apart from other phenolic components, blueberries contain a high concentration of anthocyanins, which positive effects have been described above. Numerous clinical and epidemiological studies have sorted out the causality that exists in the relationship between the consumption of blueberries (flavonoids) and the reduction of cardiovascular and degenerative diseases. The phenolic compounds contained in blueberries should also reduce blood lipid oxidation, consequence of oxidative stress and inflammation of the vascular system. As a matter of fact, a placebo-controlled and double-blind study of 60 patients with chronic venous insufficiency showed a substantially improved condition after 30 days of treatment with blueberry extracts. To conclude, we have seen that blueberries strengthen the capillaries by protecting them from oxidation, improve the contractile function of blood vessels and stimulate the regeneration of the rods in the retina. For the record, RAF pilots used to eat large quantities of blueberries before nocturnal flights during WW2 to improve their eyesight. Meadowsweet has been known for centuries and among other components contains salicylic derivatives (including salicyl aldehyde, methyl salicylate etc), which are forerunners of acetylsalicylic acid, universally known as aspirin. Just like aspirin, meadowsweet has anti-inflammatory and analgesic properties, yet it also has a major advantage over aspirin, as it is extremely safe. Unlike aspirin (synthetic), which causes ulcers and bleeding in the stomach when used for extended periods of time, meadowsweet combats gastric acid. It also contains flavonoids, tannins and a number of trace elements, such as iron, sulphur and calcium. Anti-inflammatory and anti-rheumatic and is recommended for chronic pain, migraines, throat infections, laryngitis etc. Thins the blood (Vitamin K). Diuretic and astringent (flavonoids and mineral salts): it powerfully clears uric acid from the body. Intestinal antispasmodic and urinary pain sedative. It is also recommended to treat cellulite, arteriosclerosis and all diseases related to the body being overloaded with waste. The ‘fashion’ for a Mediterranean diet is the result of a significant body of research which has demonstrated that the death rate from heart disease is lower in olive oil-consuming countries. 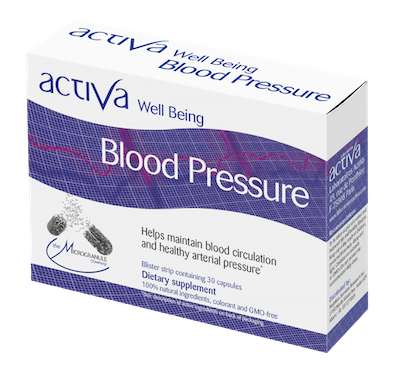 Moreover, olive leaf extract is proven to be effective, making it a safe preventive and therapeutic treatment for high blood pressure. It improves circulation by relaxing and dilating the arteries and also aids diuresis, reduces oedema (fluid retention) and blood urea nitrogen levels. Oleuropein, a significant oxidation inhibitor. Flavonoids – these are antioxidants which help to neutralise free radicals and play an important part in protecting artery walls. According to a University of Milan study, olive leaves help prevent arteriosclerosis and coronary diseases. The properties of olive leaves enable them to reduce ‘bad’ cholesterol (LDL) and increase ‘good’ cholesterol (HDL), which in particular makes them an invaluable complement when treating non-insulin dependent diabetes. Blackcurrant berries (just like black grapes) owe their intense colour to complex molecules, anthocyanins, which have properties similar to those of Vitamin P, and trap free radicals. They also contain three times more Vitamin C than oranges and are rich in Pro-Vitamin A and Vitamin E. Recent research has found that blackcurrant’s anti-oxidant power comes from a synergy of its various components (anthocyanins, quercetin, and Vitamins A, C and E). Blackcurrants are also vasoprotective and venotonic. They boost capillary resistance and permeability, thus improving microcirculation. In this respect, they can be used to prevent and treat symptoms of capillary fragility (rosacea and broken blood vessels on the legs). Blackcurrant in particular counters blood vessel wall aging. We also know that blackcurrant seeds are rich in essential fatty acids from the Omega 3 family (such as alpha-linoleic acid and stearidonic acid) and the Omega 6 family (gamma-linolenic acid, for example). These fatty acids are thought to have blood pressure lowering and anti-inflammatory properties. They are also unique because the body is able to effectively assimilate the elements contained in the seeds. They are circulated in the blood and then excreted in urine and are effective along the length of the tract. Each of the aforementioned plants contains components with their own unique properties and which seem similar. However, it is important to stress that these plants need to be “combined” to achieve a targeted and comprehensive effect. Only a complex of active ingredients enables the body to effectively regulate blood flow and blood pressure by acting on several “fronts”. Please be aware: consuming complexes of plant extracts can be dangerous and in light of the differing compositions of natural products on the market, it is vital to check the origin, dosage and concentration of the main active ingredients in products. Moreover, while many products are available containing dry extracts taken from one or all six of the plants I have mentioned, few offer carefully-developed blends to ensure maximum effectiveness in order to have a comprehensive and synergetic impact. Indeed, active ingredient synergy is an additional piece of information for the body, telling it where and when the active ingredients will act, without ever interacting! Pizzorno JE Jr, Murray Michael T (Ed). Textbook of Natural Medicine, Churchill Livingstone, US, 1999. p. 994. Royer R.J., Schmidt C.L., “Evaluation of venotropic drugs by venous gap plethysmography. A study of procyanidolic oligomers “, Sem. Hop., 1981, 57:2009-2013. Dartenuc J.Y., Marache P., Choussat H., “Capillary resistance in geriatry. A study of a microangioprotector Endotelon”, Bor. Med., 1980, 13:903-907. Neto CC. Cranberry and blueberry: evidence for protective effects against cancer and vascular diseases. Mol Nutr Food Res. 2007 Jun; 51(6):652-64. Gatta L., “Experimental single-blind study: 60 pts with venous insufficiency received bilberry extract equivalent to 173 mg anthocyanins daily of placebo for 30 days”, Fitoterapia, 1988, 115:109-116. Kay CD, Holub BJ. The effect of wild blueberry (Vaccinium angustifolium) consumption on postprandial serum antioxidant status in human subjects. Susalit E, Agus, N Olive (Olea europaea) leaf extract effective in patients with stage-1 hypertension: Comparison with Captopril., Effendi I et al. Phytomedicine. 2010 Oct 29. Syed Haris Omar, Oleuropein in Olive and its Pharmacological Effects.